Sectional Ladders. Where the ladder comes in multi parts, you fit the sections together to make the right length of ladder to climb. Telescopic Ladders. Where the ladder comes as a single unit, it extends to the required height. 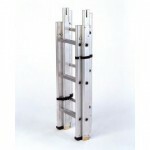 Either one of these two ladders will do the job, surveyors ladders are a personal choice, one which you feel suits you. Our sectional surveyors ladders, are made by Lyte Industries in South Wales. They have been manufacturing these for a great many years, and are, one of the leading UK suppliers. 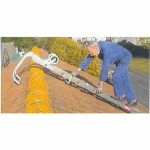 Our telescopic surveyors ladders, are supplied by either Telesteps from Sweden, or Teletower here in the UK. Both ladders are almost identical, probably due to the fact, that the same man designed them. If you wish to purchase either of these two products, from our site, click HERE they will be despatched to you quickly. All of the above products have PDF files, or, technical data shown, regarding their use, on the relevant product page. If in doubt, just call our experienced staff on 01271 858698. 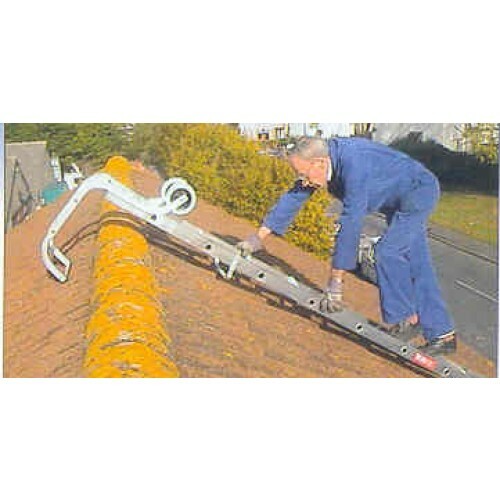 This entry was posted in Loft and Ladders News and tagged surveyors ladder, telescopic surveyors ladders, sectional surveyors ladders, sectional surveyors ladder, teletower, telesteps, telescopic ladders, sectional ladders, surveyors ladders on 2nd April 2015 by miked. 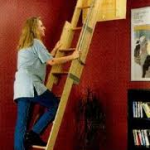 The Youngman Timberlux loft ladder, was manufactured for Youngman Group and for many years it was a regular seller for them. 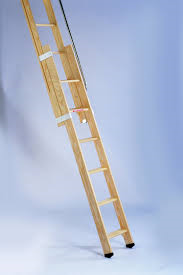 I myself , have fitted many of these ladders, into lofts and homes around the country. They were sold through various outlets, including Wickes, Hombase and Rapid. Youngman, for some strange reason, known only to them, decided to discontinue the ladder, some 8 - 10 years ago, with no particular reason given to fitters, retailers etc. Instead they went and started selling 3 part folding ladders. The Youngman Timberlux loft ladder, was suitable for floor to floor heights up to 3.2m and was operated independent of the door. It had a spring mechanism, at the back of the ladder fixed to the floor, two arms were fitted, they ran back to the top of the ladder. All in all it was a great ladder, with nice deep treads, quite a wide ladder and a handrail on the left or right hand side. Suitable for up to 150kg (23.5 stone). There was a metal catch mechanism, on the right hand side of the ladder. 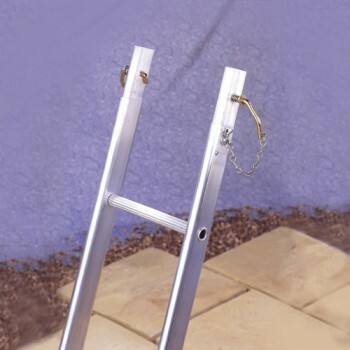 The youngman timberlux loft ladder was held together by two metal bands, which allowed the ladder section to move through and over each other when being extended or retracted. On occasions having fitted a ladder, within a week or two we would be called back to the house where it was fitted, because the ladder was said to be binding and stuck together. This happened a few more times and then the penny dropped. If the ladder was fitted into an un-insulated or poorly insulated loft, where there was moisture present, the ladder would absorb the moisture. Because the ladder sections were so close to each other, they would enlarge and the metal bands would contract, making the youngman timberlux loft ladder all but impossible to separate. We did report this fault to Youngman at the time and on other occasions and told them they needed to have the ladder sections with a greater tolerance to allow for any expansion. In the mean time, if we were fitting a ladder, we would shave off a small area of the stiles in case expansion happened, and explained to the customers, the need for good insulation. The problem was solved by the fitters, but never actioned by the manufacturer. So they discontinued what was a fine ladder, and the gauntlet was taken up by ABRU ladders with their 2 Section Sliding Loft Ladder. 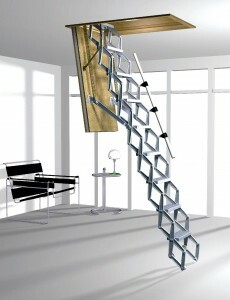 which is almost identical to the old youngman timberlux loft ladder, but, not quite the same! This entry was posted in Loft and Ladders News and tagged abru ladders, youngman ladders, timberlux, sliding loft ladder, timber loft ladder, wooden loft ladder, attic ladder, loft ladders, loft ladder on 30th March 2015 by miked. The standard trade roof ladders we sell, are made by Lyte Industries in South Wales. We have been selling these ladders for a many years and it has proven itself to be a very reliable product for all those who use it. They have non-slip rungs, box section stiles and bearer bars covered in a rubber. 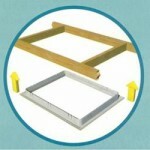 This allows the weight to be evenly distributed, preventing any damage to the tiles below. 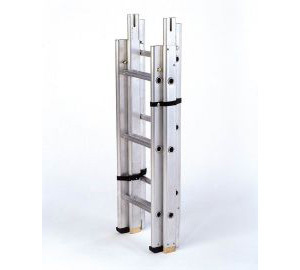 The industrial roof ladders are built with heavy duty aluminium, oval section stiles, heavy duty non-slip rungs, incorporating a heavy duty ridge hook. Perfect for all jobs you need to do. Made by Lyte Industries in South Wales. 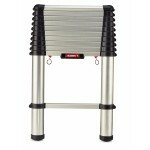 These ladders have rubber covered bearer bars which distributes weight evenly to prevent damage to surfaces. 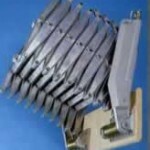 These are single section ladders, and can be extended to a variety of lengths with the use of extension pieces. Note the rung spacing on these are bigger at 27cm as opposed to 25cm spacing. It is very important to choose the right ladder from the beginning. 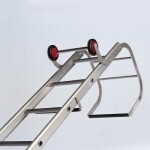 If you are used to using a standard trade ladder, then you will find the greater distance between treads on an industrial ladder, a bit odd, and, possibly a hindrance, leading to safety issues. Having a trip on roof ladders is dangerous, it is not an area you want to be having trips or falls, so make the correct choice first time. This entry was posted in Loft and Ladders News and tagged extension section, industrial, roofladders, roof ladders, roof ladder, trade on 30th March 2015 by miked. By measuring up your hatch and surrounding area, before purchasing a ladder, will determine which type of ladder you can actually fit into the intended space. Just because you like the ladder, does not mean it will fit, so your loft ladder measurements are important. Start by taking a measurement of your Floor to Floor (A). This the floor on which the feet of the ladder will rest, to the floor or top of joist timber above. Then your floor to underside of ceiling measurement (B). Again this is the floor on which the feet of the ladder will rest, to the underside of the ceiling above. If you take Measurement (A) from (B). This will give you measurement (C) which is the depth of the hatch. Measure the length (D) and width (E) of the hatch. This is the current or maximum size of the 'hole' that could be made in your attic floor to accommodate your loft ladder; this may be bigger than the size of your existing opening if you have one. Consider the position of joists and other obstructions such as cables, or pipe work that put an obvious limit, on how large the opening can be made. Also consider what your ceiling is made from, (plaster board or worse lathes & plaster can be a job for the professionals). Measure the Horizontal (F) and Vertical (G) Clearance. Measure from the intended hinge point vertically to the nearest obstruction, then make a note, then again measure from the hinge point horizontally back into the attic to the nearest obstruction, (tank, pipe work, large roof timber etc) again make a note. These loft ladder measurements are important to make sure it fits. Landing Space (H) and swing clearance (I). Landing space is measured by taking a line from the hinge of the hatch, vertically to the floor, then to the intended resting place of the feet on the floor, once the ladder is fully extended (normally referred to as the going). The distance is measured horizontally along the floor. 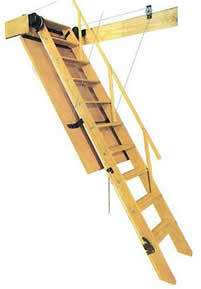 Swing clearance, is the 'arc' through which a folding ladder will move as they are retracted into the attic. You need to measure the distance from the hinge end of your hatch to the nearest obstruction, usually a wall. Weight of Individuals (J) Weigh yourself or the heaviest person in the house who might use the ladder and then add these to your loft ladder measurements, and add a weight approx 20lbs of additional weight (boxes etc you might carry up the ladder). You now have all the loft ladder measurements, dimensions and weights to hand to make the decision on which ladder will fit into the area you want. Check through the specifications of the loft ladder listed to see if they match up to your requirements. If you wish you can always talk with one of the experts on the sales team by calling 01271 858698. This entry was posted in Loft and Ladders News and tagged how to measure for a loft ladder, loft ladders, loft ladder on 28th March 2015 by miked. I have been fitting loft ladders since around 1999, during that time I have met a lot of customers of all ages, so I think I am something of an expert when selling a ladder to our senior citizens. Age brings with it aches and pains, along with problems in your hands and arms, balance also is more of an issue. When choosing a right ladder, you need to take this into consideration, what you were able to do 20 - 30 years ago, needs more of an effort. 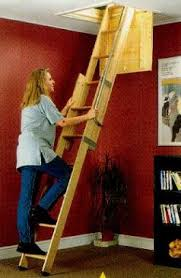 Loft ladders such as concertina ladders, which are not sprung assisted, should be avoided at all costs. They take great effort to push them into the air and store away. 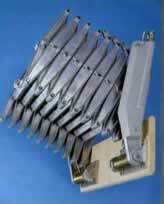 These have their own hatch door, frame and ladder and can be operated virtually with one hand. These are a little expensive, but safe sound and robust. 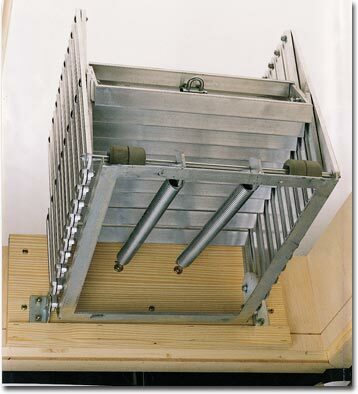 Your may want a Junior Heavy Duty Concertina Loft Ladder. 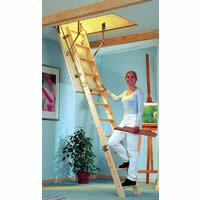 This is a cheaper model and will fit into those awkward spaces, where no other ladder will go. Again these are easy to move in and out of a loft hatch. It has sprung assisted arms on each side which takes most weight away. If when choosing this ladder, always get telescopic handrails, and choose a wider tread size if you can afford it when choosing a right ladder for you. Avoid - If age above applies to you. Avoid when choosing a right ladder for you (if you have issues in arms or shoulders, or limited stature). 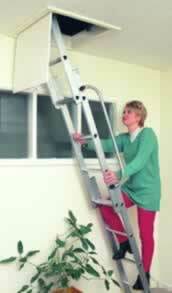 Dolle Concertina Loft Ladder. It is otherwise a good ladder, but time has taught me, that our older customers struggle with this particular model. It is held in a hatch by two springs, these keep it in a horizontal position, but they do not offer sufficient assistance when stowing it away. 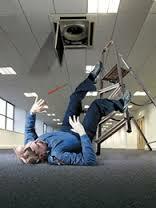 This can be (if elderly) quite difficult and, depending upon a height of a ceiling (dangerous). Anyone else using this model, are fine with it. 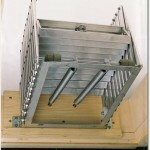 If you are not using it personally, but need a concertina ladder, due to limited space then get it. Almost all other ladders are pretty much easy enough to manage otherwise. If in doubt when trying to choose a right ladder , always call us on 01271 858698. 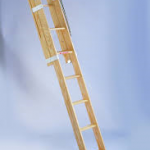 This entry was posted in Loft and Ladders News and tagged concertina loft ladders, safe loft ladder, attic ladder, concertina, loft ladders, loft ladder on 28th March 2015 by miked. I was working in Plymouth one week and went to a customers house to do a free survey for installing a loft ladder. 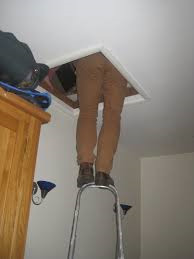 I got there and discovered the chap was using a step ladder to gain access to the loft area. Easy to use, easy to get in and out of the loft and, more important, safer than the crazy way he was getting into the loft at the moment. Well he hummed and puzzled for a while when I gave him the price for the ladder, installation and conversion of his old door into a nice drop down loft door, he then said, he would continue with the method he has used for years, thanks for coming but, no thanks.....well I was disappointed I did not get the sale but, told him to be careful and went on my way. Three or four days later, I got a call from his wife, asking me to come and install the loft ladder, because, just after I had been, he climbed the old ladder again, slipped, fell and broke his hip. Never take risks with ladders, you only have one life. This entry was posted in Loft and Ladders News and tagged step ladder, stepladders, ladder, safe loft ladder, fall from ladder, loft ladders, loft ladder on 27th March 2015 by miked. There is a Noise in The Loft Dear! Often there occurs a noise so unnerving, like a hollow thump, bump, or clang, coming from the are above you in the depths of night. Often this noise is mistaken for a bird hitting the roof, a closing door, four legged intruders, or perhaps a hungry family member empting the fridge while you are kipping. The explanation for "There is a Noise in The Loft Dear!" is something less scary and could possibly be eminating from your loft. The most common cause in the loft is contraction of ceiling joists. These timbers expand during the day and then shrink when it gets colder at nighttime. Often noises from the loft area aren’t even coming from that area in the first place. The sound is possibly made more because of the large area of space, particularly in a empty loft, often when the problem is elsewhere in the tructure - such as the interior and external walls. 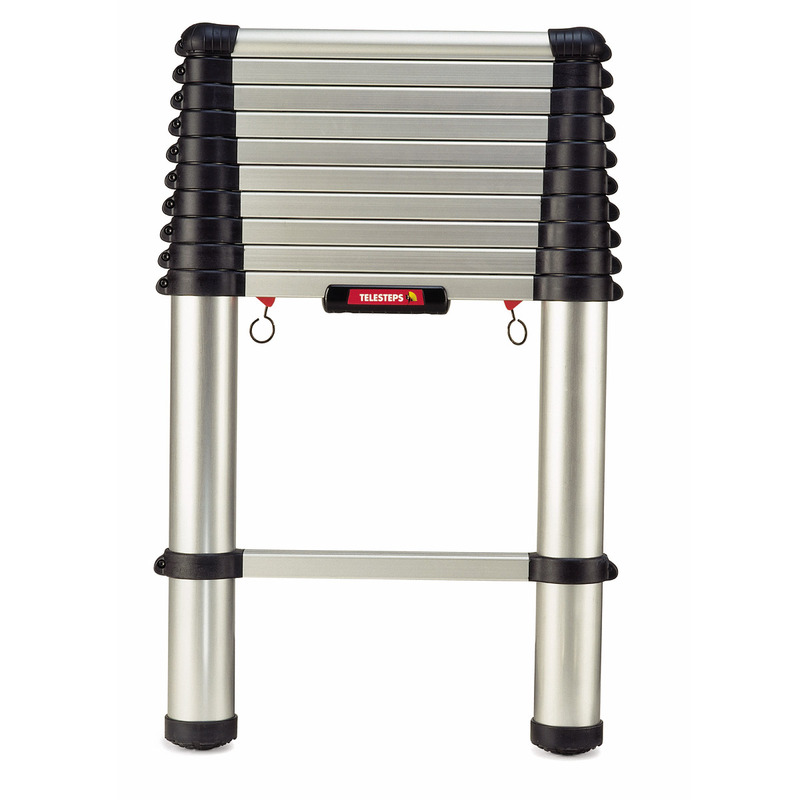 Putting is a safe and robust loft ladder will make it easy to access your loft and getting to know the location of the sound easy and secure. You don't need to be climbing some tatty old ladder in the middle of the night. Check our website for the perfect ladder for you and sleep tight! This entry was posted in Loft and Ladders News and tagged safe ladder for climbing into the loft, wooden loft ladder, timber ladder, caernarvon, attic ladder, loft ladders, loft ladder on 27th March 2015 by miked. 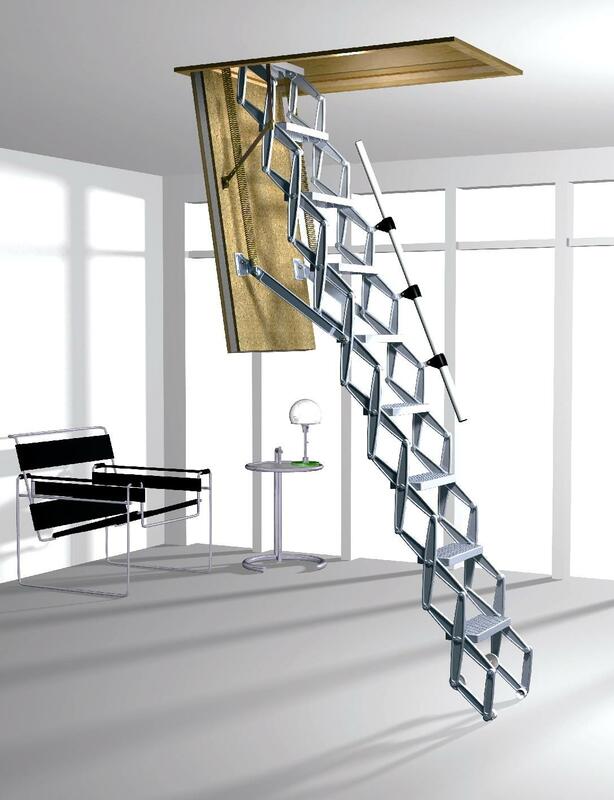 Looking for the best loft ladders for your home, then look no further than our website. We have a large selection to choose from and are suitable for both trade, commercial and DIY applications. For fitting advice, you can call us and speak with one of our expert advisers, or you can download the installation and assembly guides. We are on hand to help you choose the right product. If in doubt, please call 01271858698 and speak to our expert staff who have years worth of experience in fitting and dealing with ladders. This entry was posted in Loft and Ladders News and tagged electric, bespoke, telescopic, concertina, wooden, timber, aluminium, loft ladders, loft ladder on 27th March 2015 by miked. If you have a loft hatch catch lex 30 by Midmade, it was very probably purchased before 2006. By now, the loft hatch catch lex 30 is probably quite badly worn and in need of replacement. Why is it worn? Well the inner part of the old lock, is made of a much softer metal than the key that opens the door. 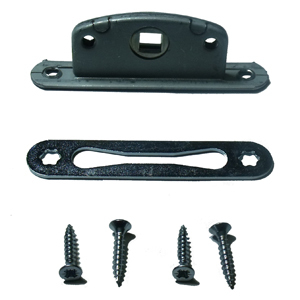 Over a period of time, and because most people do not lubricate the ladder correctly, the inner part gets worn out, the catch becomes rounded in the centre, the door will then not open or close correctly. We have these products in stock and can despatch them to you very quickly indeed. Don't wait, get yours today from our website. We do sell different catch's for lots of different ladders, along with many spares for the midmade range, all at the best price possible. If you call our expert team, they will be able to help you with all your ladder needs. This entry was posted in Loft and Ladders News and tagged midmade ladder, midmade loft ladder, midmade catch, loft hatch catch, door catch, midmade lock, hatch lock, hatch catch, catch on 27th March 2015 by miked. Ladders, Scaffold Towers, Panels, Loft Ladders, Customer Care, Hedgerose, Horwood, Bideford, Devon, UK, EX39 4PE. © 2015 Hedgrose. All Rights Reserved.